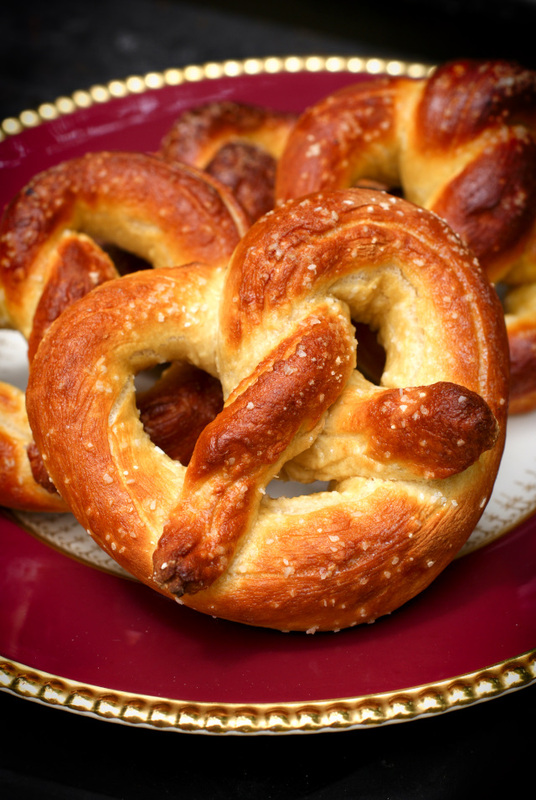 Homemade Soft Pretzels are golden, chewy, and buttery and best served fresh and hot right out of the oven. I worked in the mall when I was in college. I actually worked at a few different mall establishments: one that sold FSU memorabilia, one that sold custom Christmas ornaments, and I also was a Dippin' Dots girl. It didn't matter which one I was working for, the only thing on my mind while I was at the mall was those darn mall soft pretzels. The smell was intoxicating. 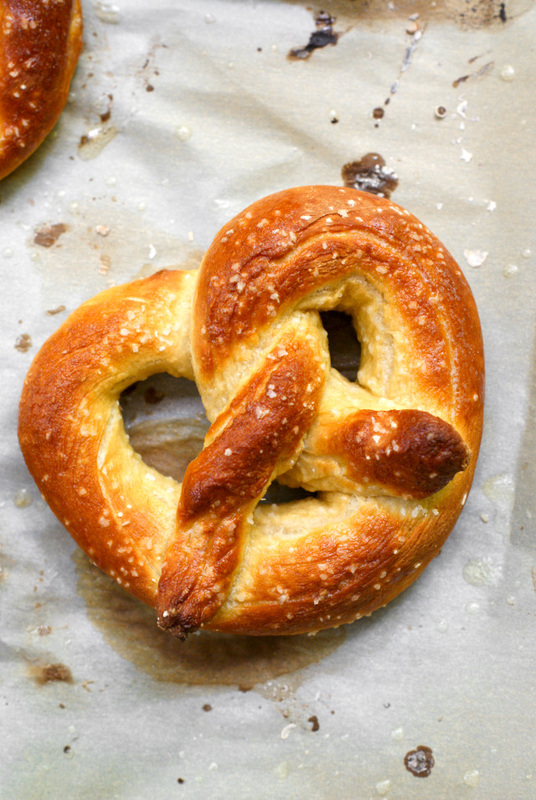 I swear, there is nothing like the smell of a fresh, hot, delicious soft pretzel. Are you with me on this one? Intoxicating, I tell ya. They should make a soft pretzel scented candle. I'd buy it. I never in a million years thought that I would be able to make soft pretzels at home and have them turn out anywhere near as tasty as the mall pretzels, but I figured I'd give it a go when my husband requested I make some a few weeks back. I was skeptical, but good Lord, they were so so good. And way easier to make than I ever expected! Preheat your oven to 475 degrees. Line a large baking sheet with parchment paper. Combine the yeast, warm water, and sugar in the bowl of your stand mixer fitted with the hook attachment. Let sit until foamy. Stir in the salt and melted butter. Add the flour, 1 cup at a time, until a dough forms and is no longer sticky. Knead dough for 5 minutes. Form dough into a ball and place it back into the bowl to rest for 15 minutes. In a small saucepan, boil 3 cups of water with 1/3 cup of baking soda. Once the baking soda is mostly dissolved, take the mixture off of the heat and pour it into a shallow dish to cool down. Take the dough out of the bowl and flatten into a disk. Cut dough into 8 sections (like a pizza). Roll each triangle into a long rope, about 20 inches long, and shape dough into pretzel shape. Place into the baking soda bath for 2 minutes. (If the whole pretzel isn't covered by the water, spoon it on top of the areas it doesn't reach). Carefully place each pretzel onto the prepared baking sheet and re-shape. Sprinkle the pretzel with coarse salt while still wet. Repeat these steps until all 8 pretzels are prepared and on the baking sheet(s). Bake pretzels for 7-8 minutes or until golden brown. Immediately brush with the melted butter. Store at room temperature in an airtight container for up to 2 days. Wow these look amazing!! I made them once but they never turned out good! These look great!